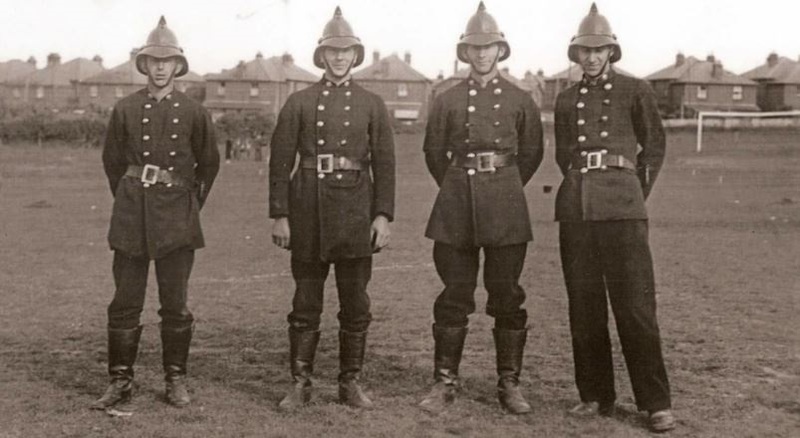 On Monday 1 June 1936 Sandown hosted the annual drill competition of the Southern District of the National Fire Brigades Association at the Broadway Ground. Including those of the IWFBF, seventeen brigades from across the south counties sent teams of firemen to compete in the events. Sandown's Chief Officer Wilfred Brown made the arrangements and was complimented for his efforts. Things didn't go quite as planned in the drills for some of the competitors. A jerk of a suddenly charged hose caused a Bridport fireman to be knocked about the face. A similar occurrence affected a team from Ryde who were setting a phenomenal pace in one of the drills but gambled on charging the hose before the nominated branch man was supported by a colleague. Accordingly the sudden jet recoil of the expelled water swept him off his feet and branch from his grasp and when Sandown followed with their attempt at the same drill a sudden and catastrophic failure of a hose length ensured a thorough soaking for all nearby including the competition judges. 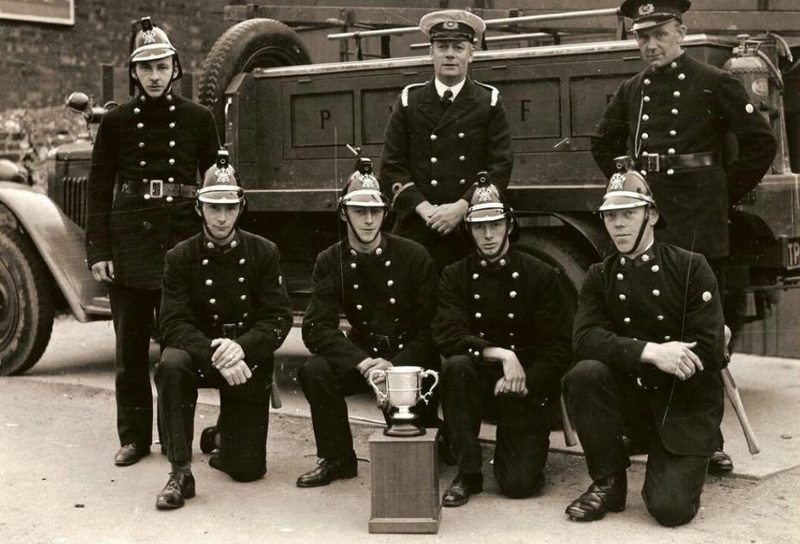 Sandown Fire Brigade's Fred Lock, Stan Blackburn, Don Orchard and Jack Gray, photographed at the Broadway Ground on the day of the competition. The event was notable for being the first time in which the District had included a breathing apparatus drill in the competitions. A young local man by the name of E. Young was pressed into service as a casualty stricken by noxious fumes. His rescue by BA donned Christchurch firemen in a time of 65 seconds won them the Siebe Gorman Trophy. Portchester Fire Brigade's team with the 'Sandown Cup' as they referred to it, for winning the Hose Cart drill competition. The weather was considered ideal for the competitors but a little on the chilly side for the throng of interested spectators that lined the arena. But one among them felt nothing but warmth and her eyes were fixed on just one of the dashing firemen as he went about his drills. The team from Sherborne Fire Brigade from Dorset competed hard but missed out on the prizes but one among them had won the heart of a young lady on the sidelines. Maude Tizzard was employed by Mr and Mrs W.E. Martin of St Leger, Royal Street, by evening she sold programmes at the Pavilion. She lived with her sister, Mrs R. Ford of Lea Road, Lake. Among the steam and water jets she fell smitten with Frederick George Abbott, 26 year old stonemason and fireman of Sherborne. When the drills and formalities were over Miss Tizzard managed to catch Fireman Abbott's eye and the spark between them was instant. As the summer progressed the couple, separated by eighty miles including the sea ensured that their relationship had every chance of blossoming and by the early autumn had made plans to be married at Lake Parish Church on 12 October. In anticipation of their big day Miss Tizzard was collected by Fireman Abbott and taken to his home town to meet his parents for the first time on Friday 2 October. They planned to set up their family home in Sherborne as soon as they were married so after meeting her imminent in-laws Maude and Frederick spent the following day shopping in Yeovil to purchase furniture for the flat they'd secured. Excited and fulfilled they returned to the Abbotts's for tea and afterwards went for an evening stroll. As they rounded a corner a motorcycle approached, they were unconcerned but for the rider the couples appearance as he leant in to the bend was an unexpected find and one he couldn't correct his machine from bearing down on. 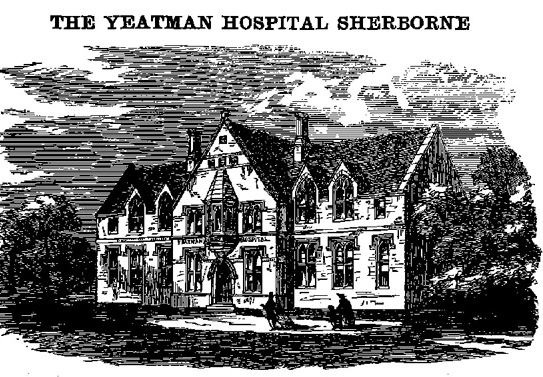 Maude took the full force of the machine and was rapidly gathered up by Fireman Abbott and rushed to the Yeatman Hospital where she was found to have a broken leg and a fractured skull. Maude lay in an unconscious state with Frederick at her side throughout the remainder of the weekend while her banns were being read for the third and last time at both the Parish Church, Lake and Sherborne Abbey. She never regained consciousness and sadly passed away on the Monday 5 October, one week before the young couple were due to be married. Though he had wished to spend the remainder of his life with Maude, Frederick felt it appropriate that her remains were returned to the Island and he escorted her, supported by some of his closest pals from Sherborne Fire Brigade, and laid her to rest at the Lake Parish Church on the Thursday five days before they should have been united in their love at the same place. In loving memory of Maude, a dear and loving sweetheart.